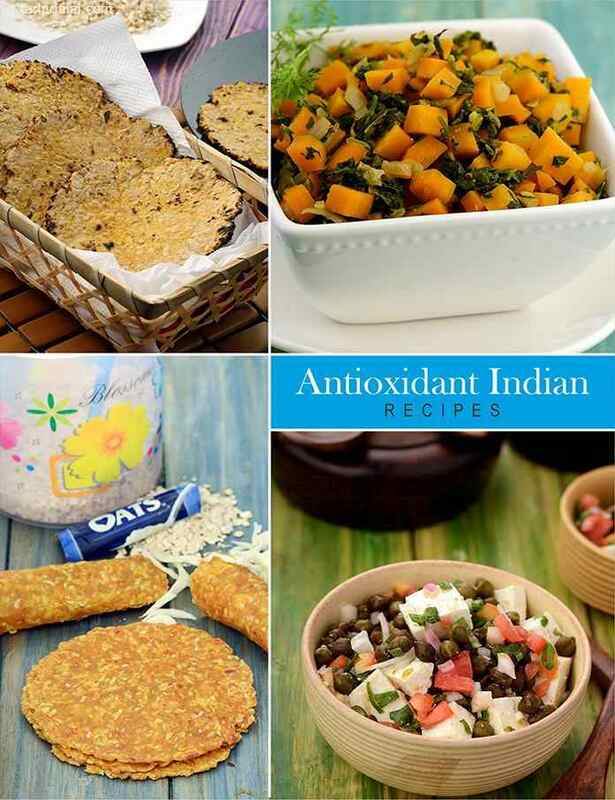 If you’ve been wondering whether Indian foods have antioxidants or not, then this section will clear your doubts. Although cooking reduces some amount of antioxidants but not all antioxidants are destroyed. Lightly tossing the vegetables, stir frying and minimal cooking on heat can be some basic techniques to retain antioxidants. We have selected recipes which require minimum amount of cooking so that maximum antioxidants are retained. You can try Vitamin A rich Carrot Methi Subzi. Try lycopene rich Tomatoes Stuffed with Bean Sprouts. Oats also contain some antioxidants like lignans and if you are fond of oats then you must try the recipe for Oats and Cabbage Roti. Alternatively try and benefit from the antioxidant ‘lignans’ from flax seeds too by trying the recipe of Flax Seed Crackers with Beetroot Dip in your own kitchen. Recipes using sprouts like Mixed Sprouts and Palak Subzi and Methi and Moong Sprouts Wrap also find place in this section. The process of sprouting increases the antioxidants like vitamin A and C by 10 to 15%. Protect and nurture the cells of your body with these Indian recipes for a refreshing and sensual experience and protecting your body from numerous diseases.